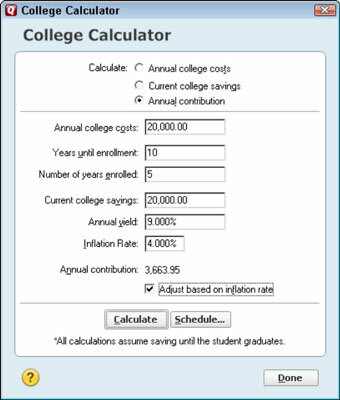 The Quicken 2012 College Calculator works like the Retirement Calculator. Suppose that you have a child who may attend college in ten years, and you haven’t started to save yet. If the local university costs $20,000 per year and you can earn 9 percent annually, how much should you save? Click the Planning tab. Click the Planning Tools button. Choose the College Calculator command. Quicken displays the College Calculator dialog box. Enter the annual college costs. Move the cursor to the Annual College Costs text box. Then type the current annual costs at a school Junior may attend. Enter the number of years until enrollment. Move the cursor to the Years Until Enrollment text box and type a number. For example, if Junior will start college in ten years, type 10. Enter the number of years enrolled. Enter the amount of the current college savings. Move the cursor to the Current College Savings field and type an amount. Enter the annual yield that you expect the college savings to earn. Enter the inflation rate anticipated in college tuition. Move the cursor to the Inflation text box and type the inflation rate percent. Select the Adjust Based on Inflation Rate check box if you plan to annually increase — by the annual inflation rate — the amount you save.